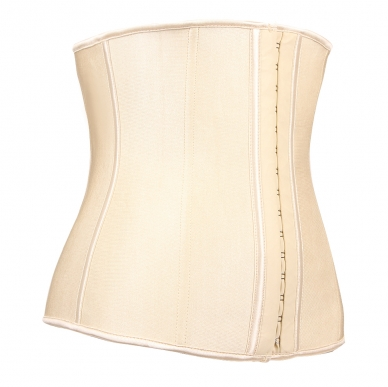 Ideal for working out and daily wear to shape your waist. Latex and steel-boned core in waist trainer promotes thermal activity and perspiration to promote waist slimming results quicker! How does it work? When fastened around your midsection, action creates compression in your core, stimulating thermal activity and ramping up perspiration. This process allows toxins and impurities to exit the skin, while mobilizing fat cells. The band itself is constructed from a latex core with a soft cotton exterior and interior lining. It sits at your waist, extending to the upper abdominals. Three columns of hook-and-eye closures allow you to size the garment down with you. Steel Boning anchors the cincher and promotes great posture.